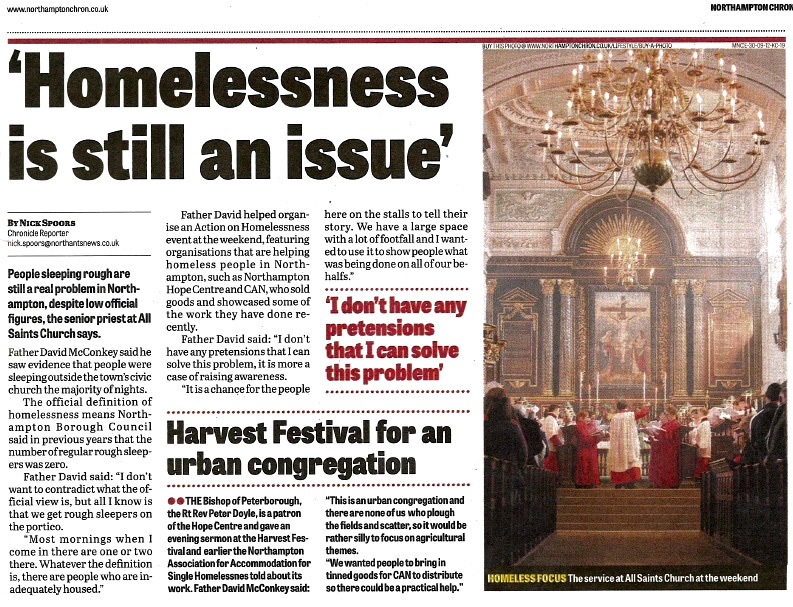 This is an urban congregation, and there are none of us that “plough the fields and scatter”, so this year we focused our Harvest energies on the needs of those who are less fortunate in our Town, especially the Homeless. 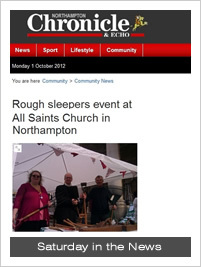 On Saturday (29th September) the Parish Priest Fr David McConkey invited a number of the agencies working with the Homeless in Northampton to set up their stalls on the Portico of the Church, to increase awareness of the problem here in Northampton. With an estimated 2000 people homeless – not just those “on the street”, but those who are “sofa surfing” and sleeping in cars and offices – the problem is much larger than people realise. A number of the agencies also brought with them some of the products that are made or refurbished, in projects that help lift people from homelessness into employment and into home. 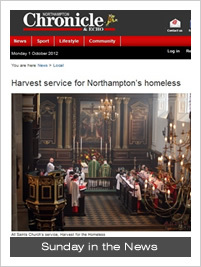 with the homeless, as a Patron of the Hope Centre and through his own personal experience. This first step in building our relationships with the agencies supporting the Homelessness in Northampton will be continued with a project involving Hope Enterprises, which trains the Hope Centre clients in Portable Appliance Testing (PAT), and in Catering. You can read the full report from the Chronicle and Echo here.